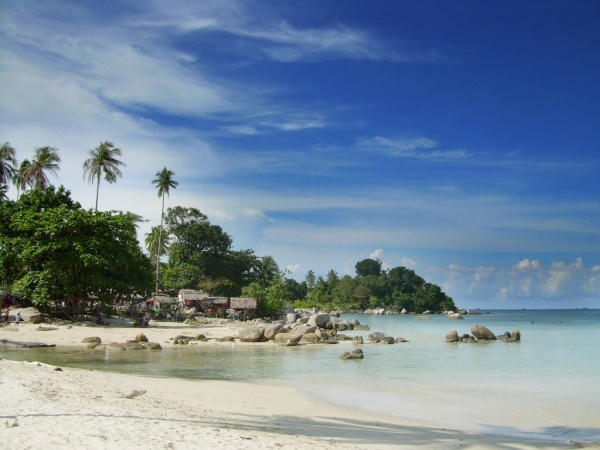 Trikora Beach is located in the village of Malang Rapat, about 45 kilometers east of the Tanjungpinang city. To reach Trikora beach from the Tanjungpinang is relatively easy because the road conditions were smooth (already on the asphalt). For the record, there is no public transport routes to the beach Trikora. So, when going to the beach, can hire a private vehicle or rental. Trikora beach has about 25 kilometers to the end, the view is beautiful. Along the beach has white sandy covered with thousands of coconut palms and other trees (mangrove). 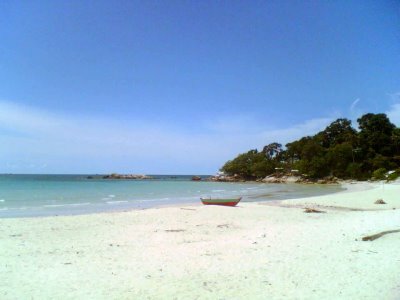 Privileged Trikora Beach lies in a vast stretch of white sand and gently sloping, so that travelers can play, sunbathe, or sports such as soccer, running, trekking, and others. In this place, travelers can also enjoy a swim or just soak exposure to sea water waves are slow and clear. Another look at the natural beauty of the many palm trees that lined neatly along the shore. There are also large rocks that were piled on edge until the jutting into the sea that also adds a beautiful atmosphere at the Beach Trikora. From above these stones, travelers can sit relax and enjoy the waves chasing each other or see the fishing boats passing by in the distance. On the beach, travelers can also see a variety of marine plants and animals, chopped into small pieces which were on the outskirts of the beach. If tourists want to see the biodiversity contained within it, can dive along the seabed to see the beautiful corals, sea plants, various kinds of fish, and various forms of sea shells. Travelers need not worry about the darkness during a dive because the sunlight can penetrate to the seabed. The travelers are also allowed to bring home the beautiful shells that he had met during the dive. After enjoying the beauty of the seabed, travelers can visit the small islands in the middle of the ocean or some tens of meters from the beach. On these small islands, the traveler can see a variety of animals such as monkeys, pythons, birds and other animals. 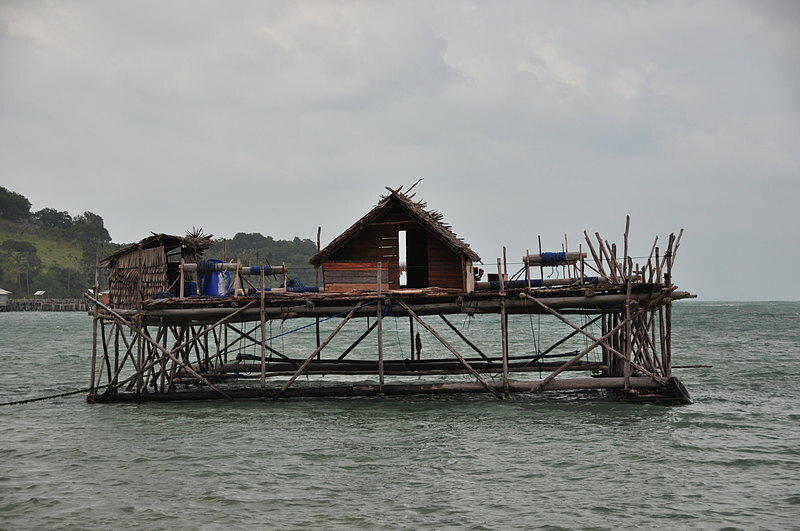 However, for tourists who want to go on tour, can go to Kelong, a place to catch fish made of wood and sago palm leaf roof. 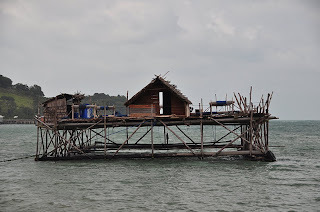 From kelong travelers can see the fishermen who are looking for fish up closer. Trikora beach can actually become a tourist attraction. 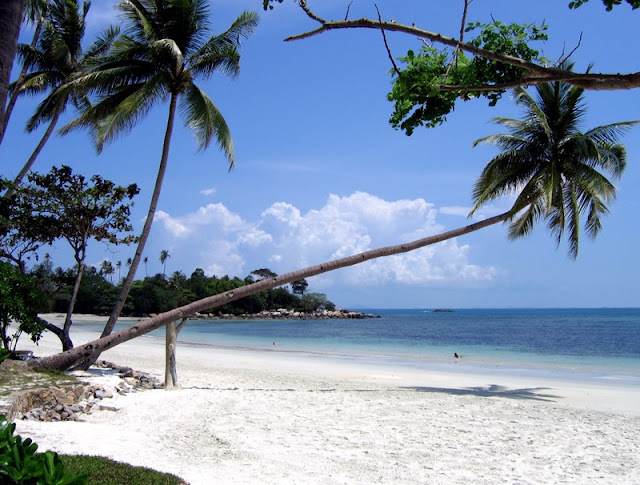 The view is equally compared to the Bintan Beach Resort is a world-class tourist area in Lagoi, North Bintan district (about 40 miles from Trikora beach). However, because management is still a "traditional", then the Trikora beach until now only visited by people from Bintan Island and surrounding areas only.